The story of the Master numbers plays on different levels. On a more commonplace level, Master numbers found in an individual's chart indicate potential access to the attributes attached to those Master numbers: the fine-tuned intuition of the 11; the formidable and practical master builder potential of the 22; the extraordinary teaching ability of the 33. It is up to the individual to reach that potential and many, but by no means all, do. Unfortunately, there is a downside to having one or more Master numbers in your chart. The nervous energy and anxiety of the 11, the frustrations and disappointments of the 22, and the shy, insecure nature of a 33. None of the other double-digit numbers with identical digits (44, 55, 66 ...) burden us with the kind of pressure, positive and negative, the 11, 22, and 33 can deliver. But there is another level where Master numbers symbolize and represent a higher meaning. 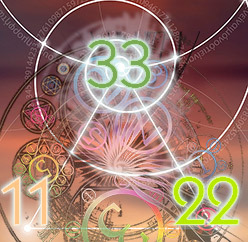 Numerology reduces all multi-digit numbers to the single-digit numbers 1 through 9, with the exception of the three Master numbers 11, 22 and 33. These Master numbers are not reduced in most cases (see below) and have a specific set of attributes that set them apart from all other numbers. Numerology enthusiasts and practitioners have always been especially excited about Master numbers because, as the name implies, they represent something above and beyond the mundane. In the last couple of decades, some numerologists have categorized all double-digit numbers with identical digits (44, 55, 66, etc.) as Master numbers. This is unfortunate not only because it is incorrect, but also because it diminishes our understanding of the real purpose and meaning of the Master numbers. The power inherent in the three true Master numbers is not based solely on the fact that they consist of identical digits, but because those digits are the 1, the 2, and the 3 respectively. In the case of the 11 (a double 1), it has the traits and personality of the 1 twice, and when added (11 = 1+1 = 2) becomes a 2, thereby combining the most powerful male energy (the 1, Zeus) with the equally potent female energy (the 2, Hera). Considering that the 1 and the 2 are on opposite ends of the spectrum and the sum of their combined attributes pretty much overshadows all other traits assigned to the numbers 3 through 9, you can imagine a merging of the strongest, most driven and aggressive warrior - an unstoppable masculine energy - with the supremacy of the most intuitive, feminine, and clever goddess. 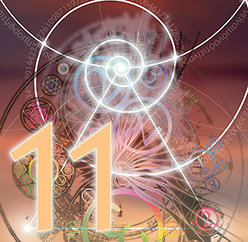 And even that does not reveal the true essence of the 11 Master number. The 11 symbolizes the potential to push the limitations of the human experience into the stratosphere of the highest spiritual perception - the link between the mortal and the immortal; between human and spirit; between darkness and light; ignorance and enlightenment. This is the ultimate symbolic power of the 11. Similarly, the Master number 22 combines a double dose of intuitive power represented by the 2, with the ultimate capacity to make dreams into reality, the domain of the 4. And again, the result is not just a range of attributes stacked to impressive potential, but the true essence of the 22: the ability to experience all that the 11 has to offer and apply it to the material world. Finally, the Master number 33 combines the most proficient powers of expression (the 3) with the teacher and caregiver par excellence, the 6. Its true essence is the final word in spiritual evolution - the Master Teacher. The ability to reach spiritual enlightenment (the 11) can become a reality in the material world (the 22), then lift others into enlightenment (the 33). The immense potential of the gift of human life as symbolized by Master numbers. Which brings me to the heart of this article - the hidden lesson of the 11. The hidden lesson of the 11. Just as Numerology adds numbers together, it also subtracts numbers looking for the difference between them - revealing shortcomings we must overcome. They represent the gaps between the stepping stones, bridges we have to build in order to continue on our path. In the case of the three Master numbers, the gap between 11 and 22 is 11, and the gap between 22 and 33 is also 11. This tells us that in order to move from the height of spiritual understanding as symbolized by the 11, we need to reach an even higher and more rounded experience of divine insight before we can apply our spiritual maturity in the material world, as reflected by the 22. 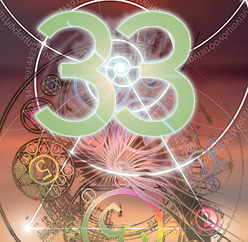 The final step, the ultimate divine reality of reaching the level of a true Master requires another superhuman boost of divine realization, this one symbolized by the number 33. As you may have guessed, I am no longer discussing the realm of ordinary human religious exercise, but rather those who have reached perennial realization in the world of spirit. This too is mirrored in the nature of Master numbers. The story of the ultimate expression of Master numbers belongs in a different realm. There are those among us who do not have a single Master number in their chart yet can - and have - reached the ultimate spiritual heights symbolized by the 11. There are some without Master numbers who experience the reality of living up to the promises of the 22 with every breath. And, if you are not just extremely fortunate but also incredibly perceptive, you may, in this lifetime, have an opportunity to meet and recognize that most precious of human beings - the Master Teacher.